Tell your story, or someone else will tell it for you. Now that mass marketing channels have fragmented and social media has blossomed, getting someone else to tell your story sounds pretty damn good. But, from the look of things, most companies just don’t get how this stuff works. Tell people a story they want to hear, and they’ll repeat it to friends, family, and strangers at the bus stop. But is it really your story that people want to hear, or in this case, tell? People tell stories about themselves. They even buy things in order to say something about themselves. They don’t give a hoot about your story unless it furthers their own personal narrative. If it does, your story comes along for the ride. If not… too bad for you. You’re not the star of this story. Smart marketers don’t even try to be the star. Smart marketers want to be indispensible supporting characters. People don’t detail every component of their new home theater system out of love for the manufacturers. People don’t proudly drive their new BMW because they idolize German engineering. People don’t recommend Tide because they want to make sure Proctor and Gamble stock stays vibrant. People respond to marketing stories when they either identify with the hero, or desire to become the hero. Your story must put the prospect front and center as that hero. About the Author: Brian Clark is Executive Editor of Copyblogger, and co-founder of DIY Themes and Teaching Sells. Get more from Brian on Twitter. The problem is in its execution. People THINK they are doing that already. If they were more objective (and willing to share this message & say ‘what do you think?’ with customers BEFOREHAND), they might be suprised at what they hear. In the book, Made to Stick it’s called The Curse of Knowledge -people who are involved – that have the information already in their head – it seems plain as day. But to the casual listener/reader/customer, it’s convoluded & hard to understand thereby losing it’s effectiveness. Putting prospects as your centerpiece with all the spotlights on will definitely make them, as you said in your article, heroes and VIPs. It’s so simple yet so profound!!!! Yet again, it boils down to marketing is all about WIIFM (What’s In It For Me)!!! Brilliantly illustrated here Brian! BRAVO!!! It is simple yet complex, just as people are. As marketer’s, we need to be careful not to always be trying to sell our stuff (or telling OUR story). We need to listen to the stories of other people (note: not other “customers”, but PEOPLE!) and see if there is a way that we can ADD to their story for their benefit, not our own. Consider a movie with “extra’s” — sometimes these extra’s make sense, they are characters in the story. Other times it is a cameo appearance that leaves us wondering what on earth that was all about. We would do well to be in the former camp and steer clear of the later. I enjoy your perspective on things. Last night, I rented the movie WANTED. I loved that movie because it it was about the main character man’ing up and taking control of his own life. I love hero movie’s because I identify with them. I’m working to become the hero of my own life. Even cartoon movies like KungFu Panda really inspire me because of the hero theme. you taken the hero theme and applied it to business. That’s just freakin’ cool ! Now you got me thinking about how to apply this to my business. Nice touchstone. Really. Helps positioning tremendously. Brian – Thank you. Each time we start a project, we should recite this to make sure we have the right perspective. The Batman & Robin Guide to Blogging. Batman is the customer / Bloggers are their sidekick Robin, making the star shine brighter. Very True, Its funny the way people have the complete wrong perception of marketing. It’s about portraying your business for what it is, not making it out to be this fortune 500 company that dominates. Word of mouth is very important, look how its worked for apple. To the two options, “identify with the hero” and “desire to become the hero,” I would add “can share credit for the hero.” On our development website stories, I try to keep donors invested in student stories by emphasizing the role that donors have in the students’ success. It makes sense. I am reviewing some behind the scenes materials , I used a year ago, and they are all wrong with this perspective in mind. Now I know why. It is easy to say “create value”. But according to who’s measure? Who’s desires and needs? It’s a matter of letting ego get out of the way and stretching a bit into someone else’s perspective. Not sure where you got that picture…but it sure does coin the topic very well. Simple is always best, and time and time again CopyBlogger brings us simple, tasteful and appropriate. Good points, good perspective. People tell stories about themselves. They even buy things in order to say something about themselves. How true, and no matter what we do this is built in to us. Inescapable. @John Michael Cannon – accomplishment, thats what every hero gets. We all desire to leave a mark for the feeling of accomplishment. It turns out that recognition doesn’t hurt either. Every spring a certain book sells hundreds of thousands of copies. Every single spring. And the book has been out for almost two decades now. But it still sells up to 300,000 copies each spring. Can you guess the book? “Oh the Places You’ll Go” by Dr. Seuss. Every spring kids and nieces and nephews and grand kids graduate from high school and college. And good ol’ Dr. Suess helps all those moms and dads and uncles and grandparents say something they really want to say. I’ve learned a ton from Tony Robbins and here’s what I learned about selling from him. You buy things for the feelings you think you’ll get from them. Stuff that helps you avoid pain and get pleasure. You seek experiences in life out of your need for variety. While seeking experiences that keep us from feeling bad and lead us to comfort we also’d like some recognition. For people to look at you in awe. Which in turn will give you the all important feelings of connection and love. So when you get the chance to find a product/service which offers the promise of ecstasy, a shift from the ho-hum, the opportunity to shine in the eyes of others which helps you click with someone… you fall head over heals in love with it. Selling is the transference of emotion. When someone or something pushes all of your buttons you wanna share this feeling with someone. Forget about worrying about the viral effect if in addition to all of these, what you sell also let’s people grow and expand as a human being while showing them how they’re also serving a higher purpose. Meet all of these needs and you’ve got em locked in for life or until you screw up unforgivably. Thanks, Brian. I can never be reminded enough times about this one simple point! Love it! So very true. Your information or product has to do something for the reader (as it relates to blogs) or customer that makes their life better, easier, funnier, or whatever it is they are seeking. However, if you have many customers or readers, their needs will not all be the same. Either what you have to offer needs to meet the needs of all your customers or readers or risk losing them. I find this with a blog. If a post doesn’t please a person one day, you risk losing them if they are subscribed to your RSS feed. However, the next day there could be a great post that they would have loved if they had stayed on board. You really need to gain your customers’ and readers’ loyalty so they will stay with you long term. The entry is spot-on. I don’t for a minute doubt the effectiveness of WOMM. It’s common knowledge that customers who live through a negative experience will tell 10x the amount of people compared to if they have a positive experience. (e.g., 20:2). Managing customer expectations is key to delivering (and overdelivering), Wowing and turning them into raving fans. When it comes to consulting others on branding, I tend to say, “Bite louder than your Bark,” in order to truly impress one’s customers. Listening, adapting and changing your business with respect to your customers, prospects and consumers is one way that generates healthy WOMM. Just a thought — one could argue that in an effort to drive a customer’s personal agenda (ego), one could offer an inferior product with stellar customer service. However, this example isn’t stable because the mob will form and will trample over one’s brand. Ya, all of it comes back to a personal Identification with the brand, but from a personal promotion perspective and not a corporate interest. Though trying to come up with any recent examples, I can’t really think of any people besides say Seth Godin or Gary V. who have actually utilized stories. Everybody wants to be an expert in Word of Mouth, but too many people think them personally having a big audience is the key to word of mouth, and they are forgetting that it’s not directly telling their story with that 1st level audience that matters in WoM, but like you mentioned in the article, it’s the power of the audience to share it with X levels of others. The concept definately works, but it is often takes a long time before it shows up in traffic for a blog or sales for a product. It can speed up if the right people like your product, of course. Good concept… Exceedingly simple in theory but can be incredibly difficult to put into practice in an effective manner. Seth Godin’s comment that no one cares about you on the internet is more true than ever. I wrote a post just this morning about Joe Girard, named The World’s Greatest Salesperson in 1973 by the Guinness Book of World Records for selling 1,425 cars in ONE YEAR (www.NaturalMarketingBlog.com). After only 3 years of selling cars, he saw customers by appointment only they were so eager to buy from him. You can’t do that without building relationships and giving people something to talk about. One thing he did was to send cards. At one point he was sending 16,000 cards every month to customers and potential customers. Clearly, this was (and still is) a successful marketing strategy. I’d ask how you can keep such an informative post so brief, but that’s what the rest of your blog is about heh. If you write about your personal experience, people can see themselves in your shoes. Sympathize with your struggles and embrace your triumphs. I like your precision on the customer’s the hero. Do you have a favorite story or reference example to share? Once the conversation is focused on what your customer cares about, you will find a natural way to migrate the conversation to where you want it to be. A flock of birds takes off in one direction as they assemble into formation. Once they are all flying together they can turn in the direction of their destination. I put my small contribution. I strongly invite you to pay attention to this book from a Montreal based agency. Conversational capital, How to create stuff people love to talk about. Drawing on their extensive experience in fostering leading brands, the authors reveal the triggers of word-of-mouth and outline a process for embedding them into your products, helping you create stuff people love to talk about. From Bertrand Cesvet, Tony Babinski and Eric Alper, members of SID LEE, a leading purveyor of experiential design and communications service for breakthrough brands including Cirque du Soleil, adidas and Red Bull. Great post. Looking at marketers as key supporting characters is an excellent way to think about things. Thank you. Speaking about customers needs rather than expounding on the benefits of their own products/services is the first hurdle that most marketers must overcome….the greater obstacle is actually telling a compelling story that engages readers. It’s unfortunate that you view human nature as being selfish & self-absorbed. People might not want to be walking billboards for commercial enterprises but they usually have mixed motivations for the reasons they do things. It’s not always about themselves, people are not always that shallow. Liz, I think you’re making a few assumptions. I never used the words selfish or shallow. I said people tell their own stories. Even the most “selfless” of acts are decisions made because the alternative would be less gratifying for that person. Even anonymous acts of charity make us feel good and reinforce the person we want to be. Everything we do is about ourselves at some level, and it’s not necessarily shallow. For example, you’re telling us how “not shallow” you are with this comment. I presume this is the way you want to appear to others, or you wouldn’t have wasted your valuable time. Great Post, we tell people never write an ad, or a sales pitch that doesn’t Ask a Question, while at the same time listing 3 benefits for the prospect! i.e. 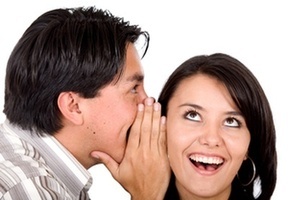 If mastering the art of How Word-of-Mouth Marketing, could Increase your sales, help people to Instantly understand your companies message, and reduce your advertising cost every month; would that be helpful in this un-stable economy? It’s always about them! If you start making a bunch of declaritive statements about your great this and great that, your prospect will be reading the inside of their eye lids. It’s always about them Liz. I think it’s fascinating how the herd nature of humans leads to word of mouth marketing – which is effectively gossiping. The natural extension of this of course is the formation of social media like Digg – which is just gossip on a massive scale – I’ve examined this from a neuroscience perspective in an article Follow the Herd. But with regards to your last point I think Seth Godin put it best in that unless you’re helping someone then it’s all just noise. Great short and to-the-point article. I spend a lot of time thinking and working with consumer behavior. Your point seemed very refreshing, think I had gotten too caught up with what I wanted to say, or what the companies I represent wanted to say… Upon reflection I completely agree, consumers are only interested in their own story, and you can just hope to be a part of it. Another way to build a readership of your story is to syndicate it through a group of like-minded individuals, via the social networks. By building strong relationships with these people and exposing their story to your own readers, one will, in turn, receive greater exposure of your story to their readership. Eventually, as more and more people notice such syndication, search engines ranking will rise and the increased visibility will develop a natural viral effect… thereby creating a perpetual internet traffic machine.